China’s Dragon Aromatics’ PX plant located in Gulei, Zhangzhou, Fujian province was hit by an explosion on April 6, causing a large fire, according to media reports. The incident reportedly happened in a pumping station and may extend the duration of an ongoing maintenance at the plant. Dragon’s PX capacity in Zhangzhou reportedly makes up 12% of China’s total PX production capacity. Consisting of two PX units with a total capacity of 1.6 million tons/year, the plant had been shut on March 14, 2015 for maintenance. It was initially slated to remain offline for around one month. 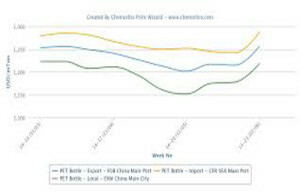 According to ChemOrbis, reduced PX availability is expected to affect downstream PTA and PET markets in Asia with local PET offers already moving up by around CNY100-200/ton ($16-33/ton) from last week. There might be some speculations of higher offers since China does not have much PX availability, players argue. A Chinese PET producer reminded that a previous explosion had occurred 2 years ago at the same plant. “We are still monitoring the situation and expect a firm trend in the near term,” the producer noted. “Following the explosion, producers are raising their export offers on FOB basis. Buyers are shocked with the high prices. These speculations of further rising may remain in place in the short term although no deals are concluded so far. Formosa Ningbo’s PTA turnaround is on schedule while overall local PTA production rates are about 60%,” a Shanghai based trader commented. The explosion on Monday night forced Ningbo Formosa to shut its PTA plant with 1.2 million tons/year plant on Tuesday, according to a trader. They are expected to resume operations by end March. Moreover, Xianglu Zhangzhou’s 4.5 million tons/year PTA capacity also went down for few days. “Local PET prices may gain up to CNY300-400/ton ($49-66/ton) this week,” he commented. A bottle manufacturer received higher PET prices of up to CNY7000/ton ($1148/ton) following the incident. “We are not rushing to purchase material given our sufficient stocks. We will adopt a wait-see stance,” stated the buyer. A trader in Vietnam reported that a Taiwanese supplier issued $10/ton hikes this week citing the explosion at one of the main PX makers in China despite weak demand as per ChemOrbis. A distributor in Thailand, meanwhile, reported that demand for PET is still quite good in the local market. “The explosion in China could generate some impact on the market in the coming week,” he noted. In upstream market, spot PX prices jumped $40/ton in a day on FOB South Korea basis, while they indicated a $55/ton increase from early April. 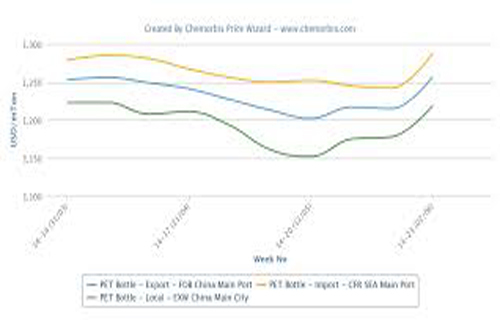 Spot PTA prices rose by $25/ton on CFR China basis in a day following the explosion, while they showed no change from the beginning of the month.